Snorkeling is a great way to spend time in the water. You can see so many beautiful things that you can’t find anywhere else. To make the most of your experience, look for the best snorkel gear sets. We researched some of the top brands and best-sellers to put together this snorkel gear review for you. But, before we get started, let’s look at some of the top features to look out for when shopping for a snorkel. Mask Type: Most of our top picks have a standard partial mask, the kind you’re used to seeing. 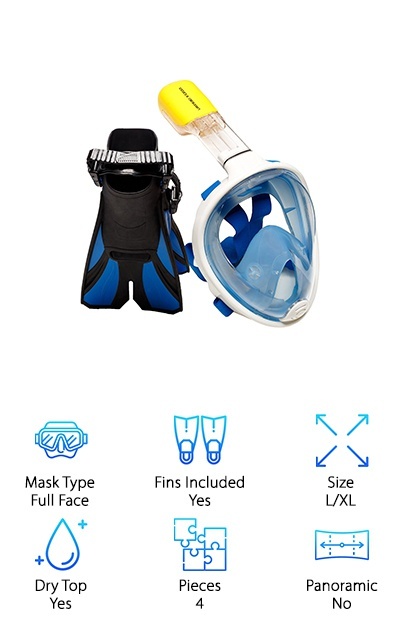 Pretty new to the market are full face masks which combine the snorkel and the mask so you can breathe more naturally. Fins Included: It’s not impossible to snorkel without fins but it wouldn’t be nearly as fun. Fins help you move quickly through the water. That way, you can easily keep up with all the fish you’re swimming with. Size: There is some range in the sizes of some of these sets while a few just come in one size. It’s important to remember that the masks and fins are usually easily adjustable to fit a range of users. Dry Top: Check this out: dry top snorkels let you go beneath the surface without getting a mouthful of water. They’re equipped with special valves that let air in and keep water out. This is a great feature for a snorkel set to have. Pieces:This number is how many items come in the set. 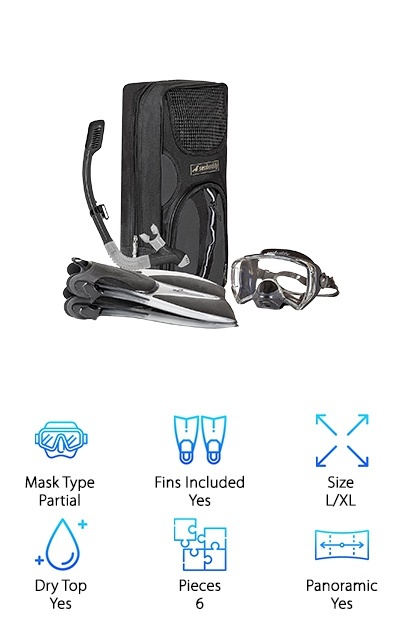 Just to be clear, we counted the fins as 2 items even though you need both of them to use them. We counted any storage as an item, too. Panoramic: This refers to the view you get through the face mask. 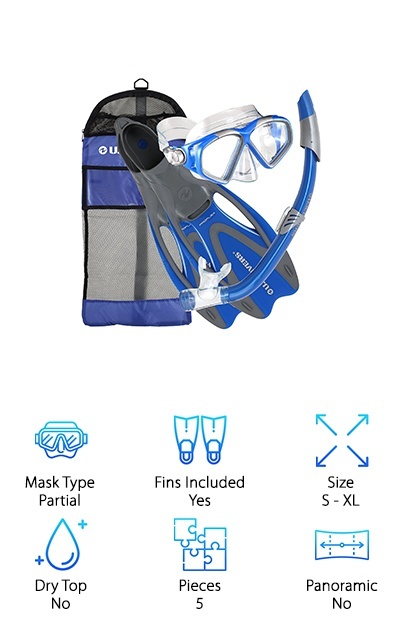 The best snorkel masks are usually made so nothing breaks up the ocean view. They even wrap around the sides of the user’s face to continue the view. Now that you know what to look for when shopping for the best snorkel sets, let’s dive right into our reviews. Get it? “Dive.” Anyway, if you don’t have a lot of time to spend, make sure to check out the first 2 items on our list. They’re the top and budget picks and give you a good idea of what to expect when you start looking. Keep reading to see the rest of our top ten choices. Ok, let’s go. The SealBussy FIJI Snorkel set is the best dry snorkel we came across. The mask itself has a 4 window, panoramic view and it’s designed to help balance ear pressure. The size is customizable, too, with easily adjustable buckles and a soft, flexible face skirt. The coolest thing about this mask is it allows to use to insert a pair of glasses if they need them to see. The dry top snorkel keeps water out even when fully submerged. Plus, it really soft and comfortable to use. 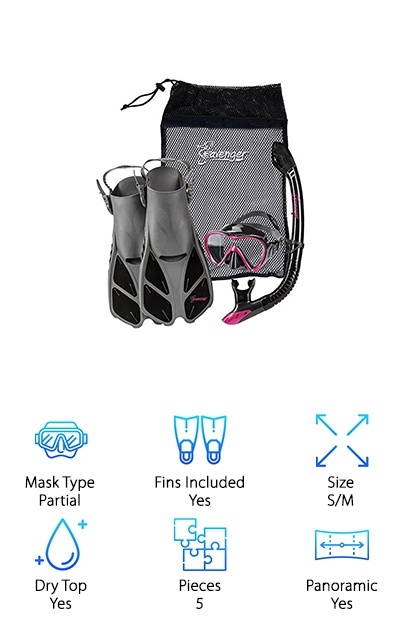 This set also includes a set of travel snorkel fins. They have an open heal so they’ll fit a range of foot sizes plus they were designed to be streamlined and great for training. One more thing: you get a carrying back to keep it all together. 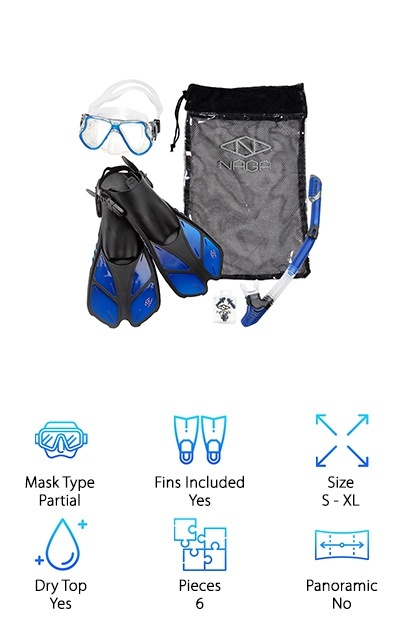 This set is from ProDive is our best snorkel mask and kit for the money. The lens is made of tempered glass which makes it strong and shatterproof. An anti-fog treatment keeps your vision clear so you can always see the cool things around you when you’re snorkeling. It’s actually made to withstand water pressures that are much higher than you’d ever reach if you’re snorkeling. The straps are soft and adjustable for a comfortable fit. This set also includes a dry snorkel so you’ll never be surprised by gulps of water ever again. It also includes a carrying bag for easy storage and travel. One thing we loved about this set is this: it comes with a 100% money-back satisfaction guarantee. Just send it back and they’ll issue you a full refund. 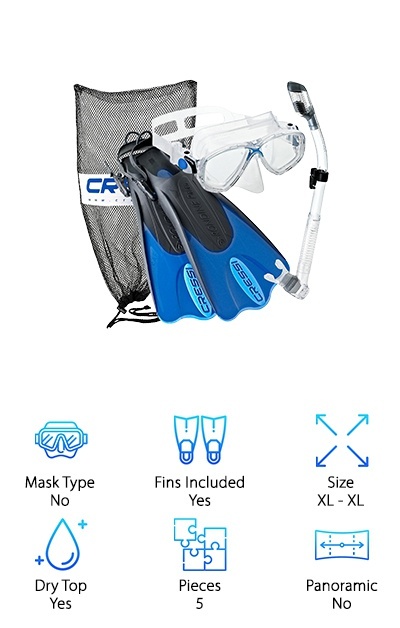 Another great option is this set from Cressi Palau is a great choice for a recreational snorkeler. The snorkel has a valve seal to keep water out when you dive so you can explore even more of the water. The face mask has a soft face skirt that creates a proper seal on most faces. To help you get a great fit, the buckles are easily adjustable. Both the snorkel and the mask are made from 100% hypoallergenic transparent silicone. They’re soft and comfortable to help you avoid any discomfort while you’re out in the water. That’s not all. This set comes with fins, too. The fins have an open heel that can fit a wider range of swimmers. They have a short fin design so they’re a little more compact which makes them ideal for travel. If you’re looking for a professional level set, take a look at this one from Aquarena. It comes with everything you need to get out on the water. The mask is made with a single piece of tempered glass. Not only is it really durable, it gives you a clear underwater view, too. The adjustable straps and soft face skirt let you adjust the mask so you get the perfect fit. 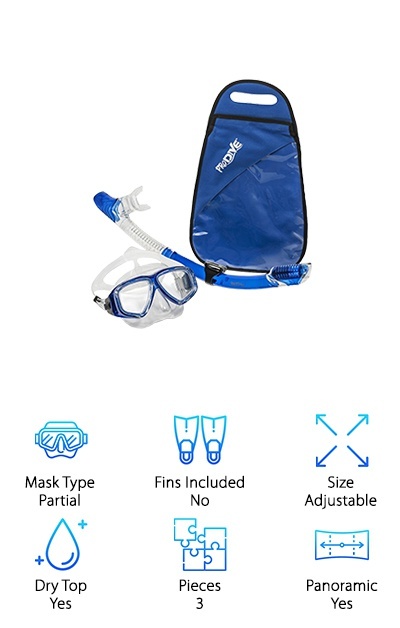 The dry top snorkel is comfortable and keeps water out even when you dive underwater/ You also get a set of fins that have an open heel with adjustable straps so they’ll fit just about any feet. While this set is made with professional grade materials, it’s great for snorkelers of all skill levels. Plus, it comes with a lifetime free replacement guarantee! Seavenger brings us this awesome snorkel set that has everything you need to get started. Let’s start off with a little thing that we loved: the number of color options available with this set. Blue, lavender, neon yellow - choose the accent color that suits you. So, what’s in the set? For starters, you get a fast clearing, dry-top snorkel. The section of the snorkel that sits near your mouth has a full-flex section. Why is that a good thing? Because it keeps the mouthpiece in a good position so you won’t experience any jaw fatigue from trying to keep it in place. The mouthpiece itself even has tabs to bite on to help keep everything in place. This set comes with a toggle-close mesh bag, perfect for letting your gear drain when it’s time to head home. 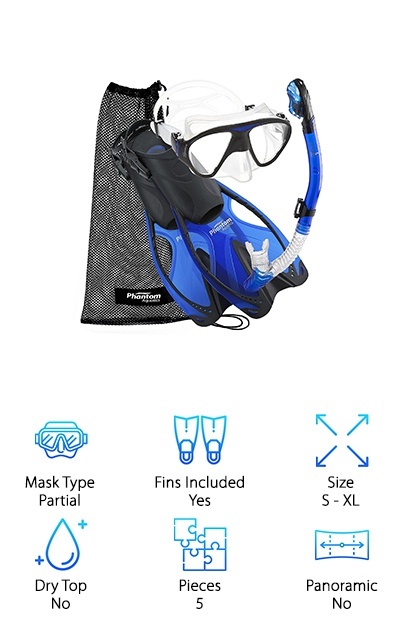 For a set with the best full face snorkel mask, look no further than this Ocean View Snorkel Set. Full face masks are kind of a new thing. They combine a partial mask and snorkel into one piece of equipment. What are the benefits? Full face masks let you breathe a little more naturally. There’s a separate breathing chamber in the mask that prevents the window from fogging up. The mask has soft, comfortable silicone padding and easily adjustable straps so you can make sure you always get the best fit. The air tube itself has a dry top seal so water doesn’t come in. If some does make it in, there’s a drain valve by your chin. 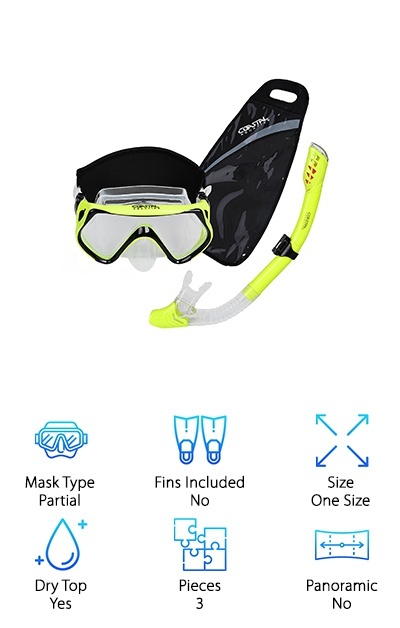 This best full face snorkel comes with an adjustable pair of fins that will fit a range of foot sizes. Another great set that comes with everything you need it this one from U.S. Divers. It has a 2-window, low profile mask designed to fit most adults. Thanks to the 3 way adjustable buckle, you’ll be able to get the right fit. 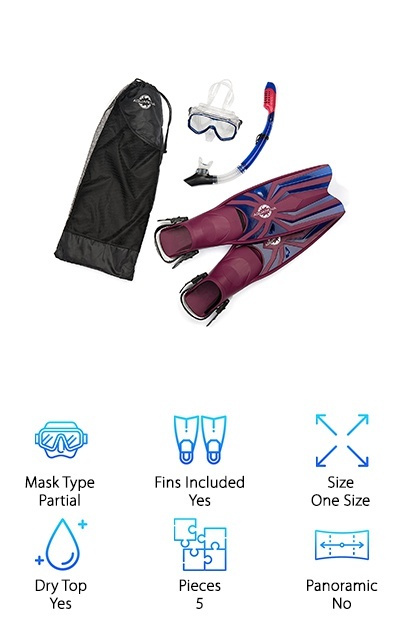 The fins in this set have a full foot pocket so take care in order to size you need because you won’t be able to adjust them. These kinds of fins perform better in the water because they have a little less drag and give you a smoother kick. A splash guard keeps water from getting into the snorkel while you swim. Plus, the mouthpiece is ergonomically designed so it’s comfortable to use. One more thing, it also comes with a mesh-paneled gear bag for travel and storage. This is a good set for a beginner, whether that beginner is an adult or a child! You get everything you need in this set. The mask is a 2 window design. The glass is heat treated, which makes it really durable. How durable? Well, it’s scratch and shatter resistant. It also has an anti-fog treatment so nothing will get in the way of your ocean view. The soft silicone face skirt creates a waterproof seal that’s pretty comfortable. The straps are really easy to adjust, too, so you can be sure to get a good fit. The snorkel has a dry-top valve and a soft silicone mouthpiece to keep you comfortable in the water. That’s not all: you get fins, too. The short fins have adjustable straps and can be adjusted for a secure, comfy fit. There’s lots to love about this Coastal Aquatics set. Let’s start with the mask. They use high grade silicone so the face skirt is really soft and comfortable but is still able to create a good seal. The tempered glass lens is really durable. In fact, it’s shatter resistant and will last a long time. One thing this set has that we haven’t seen before is a black, neoprene mask strap cover. That’s not all. The snorkel has both a splash guard to keep water out and a seal. How’s it work? A floating ball seals off the snorkel when it gets below the surface of the water. This set also includes a gear bag that not only has room for your gear but for your small stuff, like your keys or your smartphone. We love the fact that this snorkel set from Phantom Aquatics comes in so many bright colors. Not only does this let you express your personality a little, it also has a practical purpose. Your snorkeling buddies can easily identify you underwater by the color of your gear! So, what gear do you get? The 2-window mask has a really soft and flexible silicone skirt that is easy to adjust for the right fit. The snorkel itself is a semi-dry top and the mouthpiece has tabs to bite on to keep everything in place. As for the fins, they’re open heel so they can be adjusted to fit just about anyone. The fins are designed to be short, which gives you a really powerful kick that makes these a great choice for a range of water activities.